While most US residents take electricity for granted, tens of thousands of American Indians living on the 56 million acres of tribal “reservations” held in trust by the United States Interior Department and the Bureau of Indian Affairs have no access to the power grid. On the Navajo Nation, the largest US Indian reservation that covers parts of northern Arizona, New Mexico and Utah, between 10,000 and 30,000 Navajosof the estimated 250,000 populationcontinue to live without electricity. The same is true on many other reservations of the 565 federally-recognized tribesthroughout “Indian Country” inthe United States. This shortage of transmission infrastructure, as well as decades of policies that have impeded utility-scale electrical power development, makes these remote tribal regions ripe for off-grid solar development. While some of the wealthier tribes flush with money from their gaming casinos they have been legally allowed to operate since 1988 have invested in their own renewable energy projects, other tribes have traditionally relied on leasing land rights to outside investors and developers to pursue such projects. In many cases, these outside projects have either taken years to develop due to red tape or have not financially benefited tribes as promised. But recent changes in US government-Indian policies recently announced, as well a continuation of funding from the DOE Office of Indian Energy, is set to unlock the vast untapped resource of hundreds of thousands of tribal-controlled lands to solar development. In February 2011, the DOE released $6.5 million in another round of annual funding for renewable energy development in Indian Country. Of the of 19 energy project grants that will share the $6.5 million from the DOE, most are earmarked for Western tribes in New Mexico and Arizona. But more importantly, the funding comes on the heels of new government polices aimed at reducing the bureaucratic hurdles tribes have faced in leasing land for commercial and residential solar development. Late last year, the United States Interior Department announced it has revised the regulations addressing leasing of Indian land to accelerate the approval of leases for solar projects by imposing a 60-day time limit on processing the requests. With recent advances in off-grid technologies and the known potential for the solar development on tribal lands in the Southwestern United States and wind development in the Midwest Indian Country, renewable energy projects on tribal lands are now expected to boom. The tens of millions of acres of Indian lands have significant renewable energy resources though little has been realized, according to the National Congress of American Indians. Tribal lands comprise 5 percent of the total US land area while they hold an estimated 4 percent of the nation’s renewable energy resources. Some studies suggest that US tribal lands have the potential for producing up to 10 percent of the country’s renewable energy. Other studies suggest Indian Country has the potential to supply nearly four times the nation’s electricity needs with solar and another 14 percent with wind. According to an April 2011 analysis conducted by US National Renewable Energy Laboratory (NREL), the solar energy resources available for development include an estimated 4.5 million MW of PV and 1.9 million MW of concentrating solar power. American Indian reservation land can only be leased because it is held in trust for the tribes by the US government. In fact, if a tribe or tribal member wants to build a house or develop a business, the US Interior Department must approve a lease of that land. In the past, that approval process - which dates back to 1961 - took two or three years. This has hampered some tribes applying for leases for developing wind or solar projects and selling the energy produced to the grid since by the time they were approved their commercial business partners had typically moved on. The changes proposed in November 2011 would set time limits for the Bureau of Indian Affairs to approve leases for commercial land development within 60 days. If the bureau does not meet the deadline, the leases are automatically approved. These changes to the leasing regulations are an important step for solar developers interested in potential projects on Indian lands since it establishes shorter review and approval periods for proposed leases, thus providing tribes, developers and investors with greater certainty. On February 16, 2012, the Department of Energy’s Office of Indian Energy Policy and Programs (OIEPP) awarded over $6.5 million for feasibility studies, pre-construction, and installation of 19 clean energy projects on tribal lands. Since 2002, DOE’s Tribal Energy Program has provided $36 million to 159 tribal projects to spur renewable-energy development on tribal lands. The Office of Indian Energy Policy was established by Congress to provide tribes and Alaska Natives with technical support and financial assistance for project development, job creation, tribal grid infra­structure, and energy security. Over the past year, new federal programs, including the Indian Country Energy Infrastructure Working Group and DOE’s Strategic Technical Assistance Response Team, have also been launched to advance renewable energy development and initiate training programs for tribal leaders. Other federal agencies, such as the U.S. Bureau of Indian Affairs and United States Department of Agriculture (USDA), have also been recently funding programs to aid development of renewable-energy technologies on tribal lands. The Jemez tribe in New Mexico is farthest along in getting solar projects developed. Since 2010, the 3,400-member tribe has been moving ahead to develop a 4MW project using 14,850 PV panels on 30 acres. The $22 million project will be capable of generating enough electricity to power about 600 homes but has yet to find a buyer for the electricity. The DOE current grant of $301,113 will go to completing development, including acquiring a power purchase agreement, completing site-related requirements such as surveys, and finalizing financing. The To’Hajiilee Shandiin Solar project received a $300,000 DOE grant to secure funding for the Tribe’s planned Shandiin Solar Farm Development located in the remote community of To’Hajiilee, New Mexico, 35 miles from Albuquerque. the To’Hajiilee Navajo Chapter’s Shandiin Solar project will be the largest utility-scale PV array on tribal land in the US. The 33MW project will be capable of generating enough electricity for more than 10,000 homes and sits under a 115-kilovolt power line that leads to Albuquerque - New Mexico’s largest city. SunPower Corp. is helping the To’Hajiilee’s economic development team develop the $124 million construction project and negotiating with utilities for purchasing the electricity. Once a power-purchase agreement is signed, construction the project could be completed in nine months. The Pascua Yaqui Tribe, located southwest of Tucson, Arizona, received a $105,975 DOE grant to assess the feasibility of a 1 MW commercial and PV project and explore the potential of PV and hot water systems on tribal buildings to supply 30 percent of the energy needs. 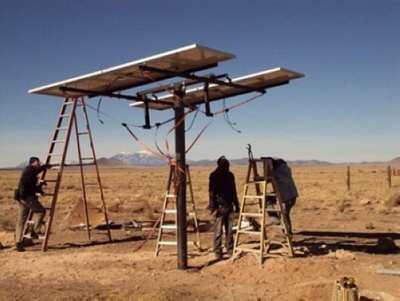 Navajo-Hopi Land Commissionreceived a $347,090 DOE grant to study the viability of installing 4,000MW of solar and other renewable energy technologies on 22,000 acres of land in northwestern New Mexico. 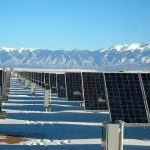 Other solar energy projects are also being developed on tribal lands using either private money or grants from sources other than the current DOE Tribal Energy Program grants. units generate alternating current using an 800-watt PV array, a 400-watt wind turbine, and back-up batteries all mounted on a shipping skid for easy transport. The units were created by Sacred Power, an American Indian-owned business based in Albuquerque. 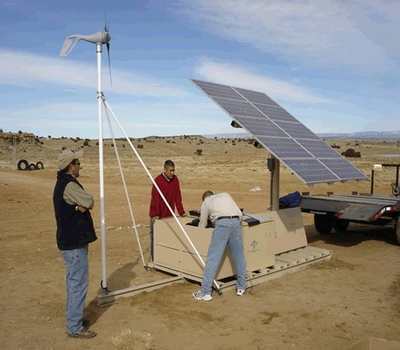 While the project has been underway for a few years, the company received a $2.8 million grant from the U.S. Department of Agriculture in November 2011 to provide additional hybrid units for about 300 rural homes on the Navajo Nation in Arizona and Utah, as well as provide replacement batteries for existing installed hybrid units. While there has always been strong interest among the tribes to develop renewable energy projects on their lands, the development has been hampered by red tape. The Department of Interior’s update of antiquated leasing rules is set to help to stimulate investment in solar (and wind) projects on Indian lands by fast-tracking approval of land leases. These changes to the leasing regulations are an important step for solar developers interested in potential projects on Indian lands since it reduces the previous uncertainties by establishing set deadlines for approval of proposed leases. 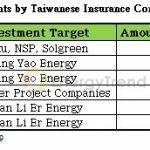 However, it remains difficult for the sovereign tribes to break into the energy market due to investor perceptions. One challenge is getting utilities interested, especially on reservations in the western U.S. where most states have renewable energy mandates the utilities must meet by a certain deadline. Some utilities have already reached their required quota and have so incentive to purchase any more solar or wind. Another challenge is culture. Those private solar developers willing to understand and deal with the fact American Indian tribes are “sovereign nations” and that each tribe has their own governing bodies and judicial systems will have an advantage. Private developers and investors will also have to take a different financing approach. Since tribes are tax-exempt and therefore ineligible for government tax incentives, solar developers and investors that can themselves take advantage of the tax credits will benefit from these projects. Nevertheless, developers willing to navigate what may be a “foreign” contractual process will also find that in most cases once approved renewable projects often move more quickly on tribal lands. The market for developing renewable energy to sell to electric power companies can be unpredictable since many utilities only buy what they need to meet their state’s mandate. And though the Department of Energy is working to accelerate expansion of power transmission lines in the southwest, these projects typically take a decade or more to site and permit due to environmental and private property issues. And such large-scale projects are not always embraced by American Indian tribes due to strong cultural concerns about how such massive projects would affect the environment, wildlife, and their ancient tribal sacred sites. In fact, six California solar projects are currently being held up by tribal concerns about just these issues. But it is highly unlikely that the gridwill ever get to some of these remote reservation areas long ignored by the utilities unwilling to for the $30-40,000 per mile cost of the power line extensions across vast stretches of land.